Specialist gardaí are examining a fifth 'love bomb' addressed to a major London transport hub after it was discovered in a Limerick postal sorting office. 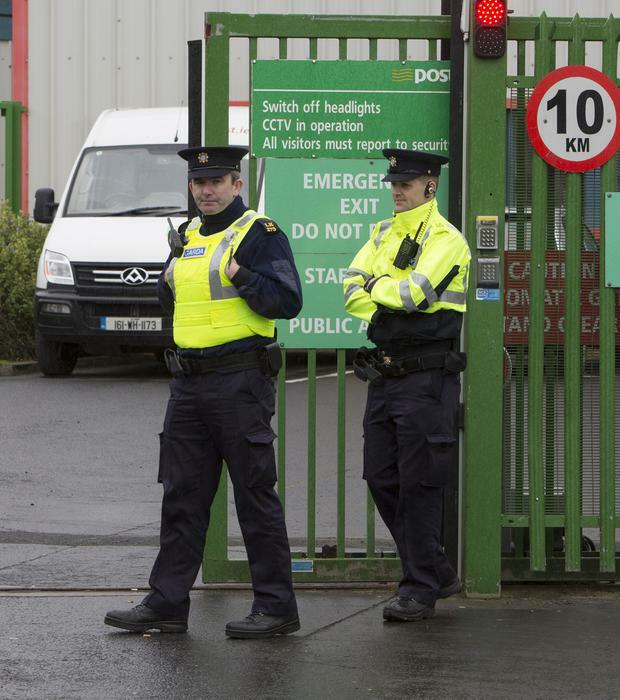 The envelope containing the viable explosive was discovered in the National Return Letter Centre in Limerick about 6am yesterday and led to an immediate evacuation of the building. It had a return address for Dublin and has been described as being identical to other letter bombs sent to Britain earlier this month. It was later defused by the Army's bomb squad and handed over to gardaí for analysis. The New IRA claimed responsibility for the letter bombs earlier this month after contacting the 'Irish News' and giving a recognised code word. The dissident group said that, in total, five devices had been sent, but only four were discovered in England and Scotland. Gardaí believe the letter bomb found yesterday is the fifth explosive sent. Counter-terrorism gardaí are continuing to liaise with their colleagues in the UK in an effort to identify those behind the letter-bomb campaign. The New IRA is being treated as the main suspect for the series of postal explosives but gardaí have stressed that other lines of inquiry are also being explored. The envelope was addressed to the Charing Cross train station, near London's Trafalgar Square, but was returned to Ireland by the Royal Mail. The return address was given as Ireland Tourism Dublin but it was sent back to the postal centre in Limerick where undeliverable mail is received. It was returned on March 5 - the same day that explosive devices were found at London City and Heathrow airports as well as Waterloo Station. The following day, a similar bomb arrived at the University of Glasgow. None of the devices exploded, but the device sent to Heathrow briefly ignited, although no injuries were reported. A senior source last night told the Irish Independent that detailed analysis of the device would be carried out by gardaí to recover evidence which could identify a suspect. "It will obviously go through all the relevant tests, we will look for DNA, fingerprints and gardaí will also be examining the components of the bomb to see where they came from. "How much incendiary was in the bomb has not yet been determined but a real danger would have been it catching fire in a mail room and spreading through other envelopes and letters, which would have caused serious damage and risk to workers in postal centres that this envelope passed through," the source said. Detectives have not been able to establish the exact location from where the letter bombs were sent but are satisfied they were posted within Ireland. The investigation involves detectives based at Henry Street garda station who are being assisted by a number of Garda national units including the Special Detective Unit (SDU) and members of the Security and Intelligence Section. Justice Minister Charlie Flanagan said the sending of a letter bomb was "an absolutely despicable act". He said the incident was "a dreadful consequence of the uncertainty surrounding Brexit where in the context of the heightened tensions in Northern Ireland, on the island of Ireland, that people have taken it upon themselves to send letter bombs".